With album number eight, The Sin And The Sentence, Floridian metal warriors Trivium return with a vengeance. 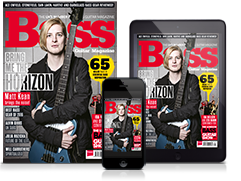 Bassist Paolo Gregoletto reveals the secrets behind the (very) low notes. Chatting to Paolo Gregoletto, the mellow- talking bassist with Trivium, you’d have thought he’d be done talking about the heavy stuff for a while. After all, it’s not long since he returned from his band’s most recent North American tour, and it’s only a matter of days (as you read this) until the group are coming to the UK to support their mesmerising new album, The Sin And The Sentence. But nope - it turns out that Gregoletto’s untiring appetite for metal can never be satisfied. Having to play at breakneck speeds in a band that’s heavier than a skipful of lead has become a way of life. A quick history lesson. Helping to consecrate the New Wave Of American Heavy Metal movement earlier in the century with the generation-defining album Ascendency back in 2005, a titanic expectation was burdened squarely on Trivium’s collective shoulders. Being hailed as the next Metallica, a feat no other metal band could (or may ever) equal, is a lot to bear, especially when you consider that the group - Gregoletto plus Matt Heafy, guitar and vocals; Corey Beaulieu, guitar; and now Alex Bent, drums - weren’t even old enough to buy beer at the time. Since then, Trivium have contributed more to the metal scene than they’ve been given credit for. The group were part of something unique in heavy music, injecting the aesthetics of Iron Maiden with a solid dose of melodic extreme metal; their sound has remained relevant within the metal scene ever since. 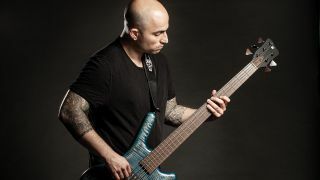 In bass terms, Gregoletto’s incredible three-finger plucking technique is only surpassed by veterans such as Cannibal Corpse bassist Alex Webster. Although he’s equipped with fingers that could only have been constructed at NASA, Gregoletto is not one to turn his nose up to a pick from time to time, as he explains. He continues: “For me, playing fast is great, but the detail’s got to be worked out. Usually what I do with a fast part is slow things down, get every single note on the money and then slowly build it up. When I come back to it the next day and I play it at full speed, it becomes second nature. The bass parts should not only be fast and intense, but also be very clean, and have all the notes pop out. By adding that into the mix of our sound, it gives punch to those parts that I love to bring with the bass. Trivium’s latest album The Sin And The Sentence has been praised for encompassing everything fans love about the band. You’re missing out on a treat if you’ve not already blasted this album; it could start a circle pit around your coffee table in seconds. As one of the chief Trivium songwriters, Gregoletto has to balance his bass parts with the needs of the songs; how does he do it, we ask? “Well, in the song The Revanchist, that was 100 percent me thinking about my bass part before anything else!” he chuckles. “As soon as I wrote it, I knew it would sound really badass on the bass and was going to feel really good to play live. A song like that is definitely focused on the groove. “Our drummer Alex has this amazing pocket he plays in, and to feel that in the song it’s so exciting. I feel really good about the bass on that song. The middle has this interesting off-time riff that we do. It felt really good to play on the bass, which was my goal right from the beginning when it came to writing for this album. Not too long after the album cycle for Trivium’s 2015 album Silence In The Snow, Gregoletto switched from BC Rich to Warwick. For over a decade, Gregoletto had been synonymous with the former brand, first with a Mockingbird and then with his signature Warlock basses. It’s not as brash-looking as its predecessor, but his new Warwick Corvette oozes class. What exactly spurred on the change? “It felt like the right time to do a switch,” says Gregoletto. “Right away, Warwick stood above the pack. I pretty much joined up with them at the end of recording Silence In The Snow. I had been with BC Rich for 10 years and I checked out a couple of companies, but Warwick immediately just stood out. I knew their basses were incredible, but the company were just so welcoming, and that was very important to me. Every time I go to practice it’s a joy to play; it just feels effortless to play on them. “The neck on it is wenge wood, which is super, super hard,” he says, detailing this five-string beast. “I think it would take a lot to do some damage to that thing. I went through their factory when I visited, and they explained that when they get the wood in, they let it dry out in the air for a year or two, and then it goes through a dehydrator. There’s no moisture in the wood at all, so they feel super durable - and you know how travelling with instruments can be,” he says with a smile. The subject of Metallica was always going to crop up sooner rather than later into our conversation - and let’s face it, no proper metal chat is complete without it. To the old guard who’ve been with the four San Franciscan horsemen since their dawning, we’re fully aware of the can of worms that Metallica’s infamous Load and Reload albums from 1996 and ’97 open. However, if you grew up in the 90s, these albums were the first real exposure that a lot of young metal fans - Gregoletto included - had to Metallica. We know that Jason Newsted’s playing during his time with that band from 1986 to 2001 made a drastic impact on Gregoletto as a musician, so can he name his favourite Newsted bass-line? “Hmm, maybe King Nothing, that’s a really good one. It was my introduction to that band,” he muses. “I happened to luck out when I got into Metallica. They were in this interesting period as a band; the bass playing was very prominent in the mix, and on the Load record in particular. It just showed me right away how a great bass tone can really make a band. Trivium’s recent UK and European tour saw them supported by Code Orange, Power Trip and Venom Prison for more than 30 dates. It’s important to keep new music in the metal bloodstream, says our man. “The goal behind the tour was to find the most exciting, killer, fresh new bands at this moment in time and see if we could get them on the bill with us. Championing these new bands is a very important part of Trivium. As we’ve grown and the more people get to know us, we’ve realised that what we have to think about is: what are we going to put back into the music? The Sin And The Sentence is out now via Roadrunner.